Networking Cocktail Reception: 5:15 PM — 7:00 PM Limited to 70 participants. This is our second annual symposium for simulation education. 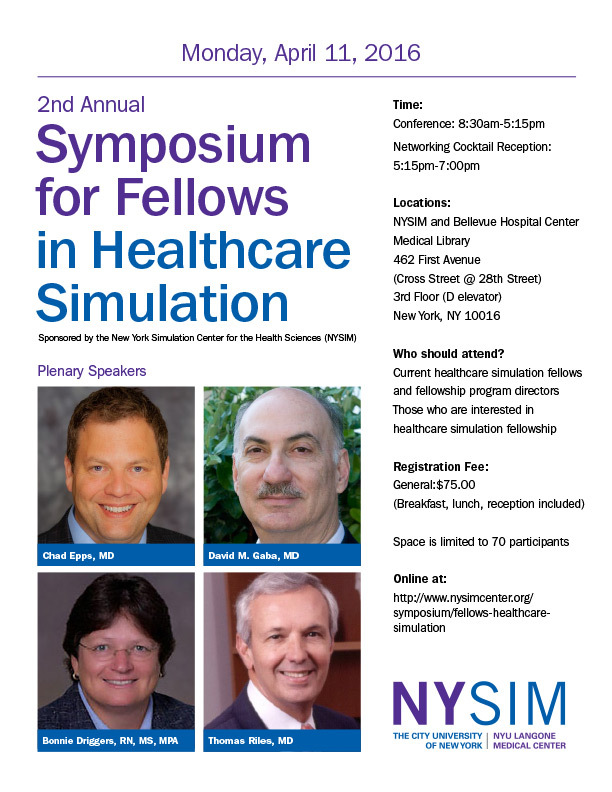 Held at NYSIM facilities in New York City, this one-day symposium draws top simulation educators, experts and researchers from around the country who lead a lively day of plenary sessions, panels, discussions, poster presentations and breakout sessions. Topics include High stakes assessment in simulation, Self-regulated learning and simulation, Debriefing for clinical events, Mastery Learning in simulation, Interprofessional education using standardized patients. Network with other early career healthcare simulation educators in an effort to build a community of developing leaders in the field. Share and discuss fellowship capstone projects/research. Identify key skills for career development in simulation education.